hey everyone! thanks for playing name that yarn. all yarns are now brandishing their new names (click over to flickr to find them out). there will be some more naming early next week in an attempt to get them all ready for ‘i made it’ on the 9th. 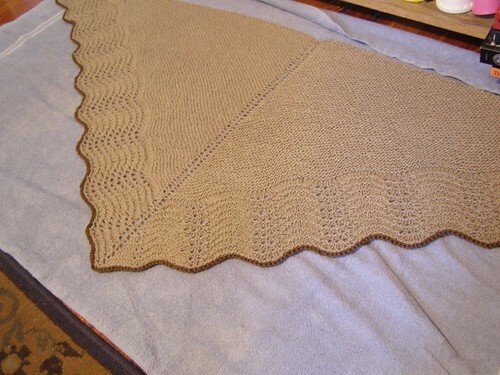 today there is blocking happening – expect a real post about this shawl once i get some decent pictures. the torrential rain we are having today is none too good for such things. as to the other knitting i finished yesterday – the aforementioned movie knit. so. they need three of the same thing for continuity and such… and my second one? 1/2 in. taller than the first. grrr. mostly because i remembered to alter my tension and make loose stitches more often during this one. i guess i’m still at only one down. ben and i both like the newer one better. it’s still irritating. This entry was posted in cosyknitsliterally, cosyspins, handspun, knitting, shawls, spinning by cosymakes. Bookmark the permalink. Thanks for linking my spinnerly blog the other day! I did not participate in the yarn naming fun because I have enough trouble naming my own yarns and dyed fibres. At first I looked forward to that part of the job immensely, but it’s getting harder and harder! The shawl is lovely. I like the final row worked in the contrasting colour.